Thanks for joining us today, Shirley. Could you start by telling us something about your current performance projects? Sure. I am currently performing with my trio/quartet, with whom I released my first album, ‘Long Story Short’, recently. We have quite a few performances this year, and hopefully a tour next spring. I’m also writing material for my next album, although that may take a while to be ready for performance! 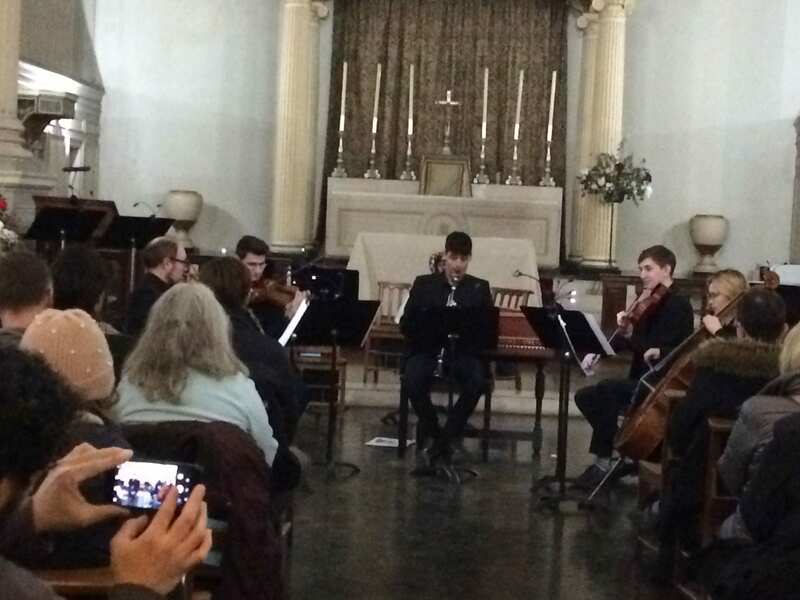 Other projects which I lead/co-lead are a duo with reeds player James Arben – this is a completely freely improvised project, mostly as a duo, but sometimes with guests. We have recorded quite a bit of music recently, so may well release an EP or an album with that. An extension of that project is a quintet, which adds pianist Alexander Hawkins, drummer Jon Scott and bassist Liran Donin. We just gave our first gig recently and we all felt it worked, and there will be more coming with that project soon. A freely improvised group is so dependant on a huge amount of implicit understanding and trust between the musicians, so we were all very happy that this worked. I also have a jazz string trio with violinists Matt Holborn and Richard Jones. This is a relatively new project that we have been trying to put together for about 2 years.The three of us felt that string players in jazz often get overlooked. Matt and Rich are both amazing jazz violinists, but also very different players so it’s an interesting balance. I play in Issie Barratt’s band Interchange, which is a dectet that she founded in 2016. It is an all-female group, and was founded to address the imbalance of gender in the jazz world. We were all commissioned to write a work for the group, and the album ‘Donna’s Secret’ is due for release later this year. My final, and one of my favourite bands ever, is the trio ‘Sawa’, with vocalist Alya Al-Sultani and pianist Clemens Poetzch. This was founded in about 2015, and is a totally unique synthesis of Iraqi folk music, jazz, chamber music and free improvisation. As Clemens lives in Germany, we don’t get to play together that often, but I love it when we do!! What is the most exciting country/venue/space that you have played at? I suppose, having lived in Jerusalem for 10 years, that would have to count in its entirety as the most exciting (and challenging) place to have existed musically in. It was incredibly fertile and I was involved in all sorts of things, from jazz to classical Arabic and Turkish music, all of which inform my musical activities now. What is the highlight of your teaching career so far? It’s difficult to pin-point one particular thing, as I get different things out of different contexts, and they all present different challenges! I really enjoy teaching at the RCM Junior Department, where I do a lot of improvisation work, since this is very marginalised in classical education – although I think it is better that it was 15 or so years ago. A couple of particular highlights I think were a workshop I gave for Jazzlines in Birmingham a few years ago – the students were so keen and eager to learn! We worked on a North African tune completely by ear, and performed it at the end of the session in the Symphony Hall Foyer. 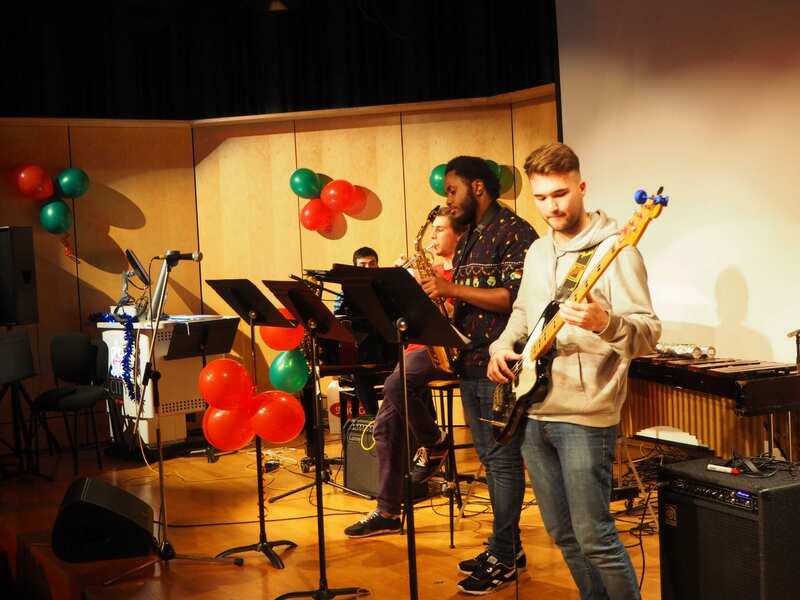 The group included Xhosa Cole, who recently won the BBC Young Jazz Musician of the Year, who came up at the end and extracted a list of everything I knew about world music – he was so keen to absorb everything he could, which is an absolutely fantastic attitude to have!! I also had Jacob Collier in some of my improvisation classes at the Royal College of Music when he was about 14 – and I remember him turning a large metal cupboard into a drum kit for one lesson! He has the type of mind and creative ability that was always going to flourish, but it was an interesting experience to see it that young, and watch it in action. If you could give one piece of advice to music students, what would it be? Learn to use your time well!! And always try to be specific about what you are practising, and what needs working on. Reserve some time for developmental work – which can take time, rather than only learning stuff for upcoming gigs. I guess that’s 2 pieces – but never mind! What would you recommend students do beyond practising their instrument/voice and rehearsing? Again, learn to use your time well. And be on time for things. The music profession – especially the session world – is very highly time-constrained, and being on time is a central part of your professionalism and really good habit to get into early. So much is about taking responsibility for yourself, being respectful to others, and learning to discuss any issues – musical or otherwise -calmly and professionally as well. How has the music world changed since you were a student? This is a huge question, as things are very different in different parts of the music world. 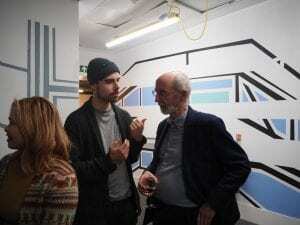 I think in many ways the creative scene has become more open – there’s a recognised renaissance of British Jazz, and some really exciting bands around, as well as some really interesting cross-over-y type projects. Also, the development of the technological side of things. Sites like YouTube have increased access to music and made releasing video much easier. I don’t want to get into the impact of streaming and so forth, although that’s definitely a topic worth discussing, and any students who are making and releasing their own music should absolutely be aware of the models of companies like Spotify, which is terrible for independent artists, although it’s also a really useful resource. Bandcamp is much better for musicians, as most of the revenue from sales goes actually to the bands, so I now try and make sure that as many people as possible know this, as people tend to buy music from iTunes or other sites because it is easy and familiar – but again, it’s awful for musicians as the artist gets something like 3% of the revenue – as opposed to 85% from bandcamp. This s a big change since I was a student. This entry was posted in Uncategorized on April 9, 2019 by laudan. 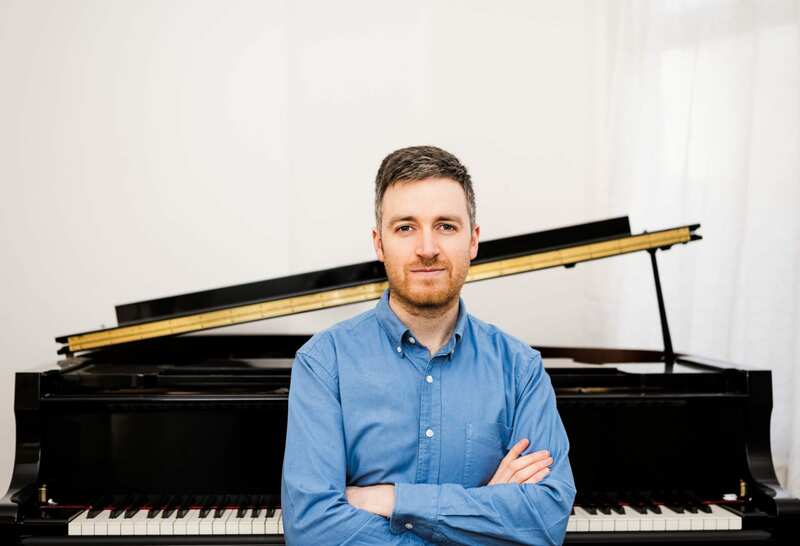 The third in our series of interviews with visiting instrumental and vocal teachers at City features pianist Richard Uttley. Many thanks for joining us, Richard. Could you start by telling our students something about your current performance projects? One unusual project I’m particularly enjoying at the moment is playing Erik Satie’s ‘Entr’acte’ music from his ballet Relâche, which was written to accompany a silent film by René Clair. I’m playing it in the piano duet version with my friend and collaborator Kate Whitley, and we’re performing it live with the film. We spent a long time experimenting to work out how we could bring out as much subtle detail in the timing between the music and visuals as possible; it was a labour of love but that makes it so enjoyable for us to share the result with audiences. As well as being a pianist, Kate is also a composer and she’s writing me a piece that I’ll premiere in a recital at City this spring. Other things I’ve got on the go this season include the Gershwin Piano Concerto, which I learnt over summer and played in the Queen Elizabeth Hall recently, and a cycle of all ten Beethoven sonatas for piano and violin for a tour in Scotland next month. What is the most exciting country you’ve played in? I’ve toured in China several times in recent years, and have given recitals in over twenty cities there. I didn’t get to spend a long time in any of them, but to play and travel in a totally different culture was a great experience and one I feel very lucky to have had through music. What is the most memorable concert or other musical event that you have attended? It was a concert at LSO St Luke’s (just round the corner from City, in fact) that was part of a Barbican festival in 2007 focussed on the music of Thomas Adès. I wasn’t living in London at the time but made a special trip to attend this concert as I was obsessed with Adès’s music back then. The concert included, amongst other things, the composer himself playing his mesmerising Traced Overhead (I had no idea until then what an incredible pianist as well as composer Adès is), and a very starry Les Noces, with Peter Donohoe, Rolf Hind and Katia and Marielle Labèque on the four pianos and an amazing group of Russian singers called the Pokrovsky Ensemble. If I could go back in time to hear concerts again I’d go to that one every week! What is the highlight of your music teaching career so far? I started teaching when I moved to London in 2008 and I still have one of my very first pupils, who was a complete beginner when I began working with him. He’s still young but now an excellent pianist and fine musician with genuine curiosity for music of many kinds. Not a highlight in the sense of a one-off event, but I consider this a real achievement. What was the most important thing you learnt from your own teachers? How to control sound at the piano, and why that’s so important. If you could give one piece of advice to music students, what would it be? Listen to lots of music, and go to concerts. I learnt a huge amount from going to as much as I could while I was a student (and still do in fact), and even from page turning for other pianists! I think there was a time, in generations gone by, when everyone knew a lot of classical music simply because it was what was played at home and was talked about with knowledge and enthusiasm by many people. Unfortunately, today it’s much more likely that you’re going to have to find out about these things for yourself. The same rewards are there at the end of course, but you’ll probably have to be more proactive to find them. 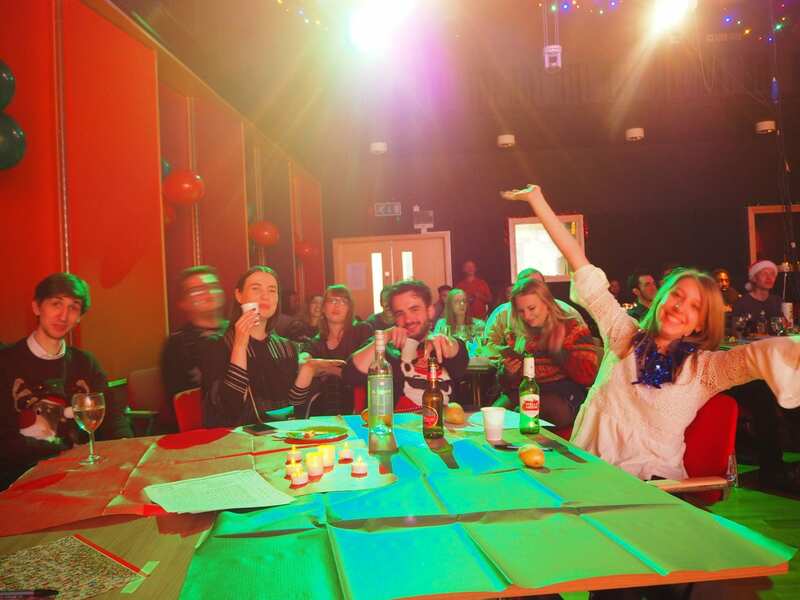 What was the best thing about your own course when you were a student? Individual teachers that I encountered. My analysis tutor was a PhD student at the time and I was so inspired by the way he thought about music and discussed it with us. When I got the opportunity to make my first recording I asked him to write me a piece – it was based on dance music and all my friends loved it, so it became a proper party piece for me. His name is Chris Willis and he recently scored Armando Iannucci’s film The Death of Stalin; the score’s all pastiche of 1950s music from the Soviet Union and has been winning worldwide acclaim so I’m quite chuffed to have spotted Chris’s genius early on! What would you most recommend students do beyond practising their instrument/voice and rehearsing? Make the most of being in London. If you come to study at City you’ll be in the heart of an incredibly vibrant city, with world class food, theatre, concerts, museums and galleries – to name but a few things – and this is a great opportunity to have experiences that will stay with you for a lifetime. Students get cheap tickets too! This entry was posted in Uncategorized on March 11, 2019 by laudan. The second of our series of short interviews with visiting music staff at City features leading international violinist Madeleine Mitchell. Many thanks for joining us, Madeleine. Could you start by telling us about your current performance projects. What is the most exciting place you’ve performed in? I’ve played in over 50 countries so there are many exciting places to choose from, including the extraordinary German Cultural Centre in Madagascar (at the invitation of the British Ambassador), the Sydney Opera House and representing the UK at a festival of British Culture in the Lincoln Center, New York just after 9/11. New York is particularly dear to my heart since I was Fulbright/ITT Fellow there years ago. What is the most memorable concert or other musical event that you have attended? I love opera, and Mozart in particular, so probably it has to be hearing Le Nozze Di Figaro for the first time, with Kiri te Kanawa’s beautiful soprano voice as the Countess, at the Royal Opera House. What is the highlight of your music teaching career so far? Devising and running Performance Seminars at the Royal College of Music, mentoring the graduate cohort of solo/ensemble instrumentalists for the last 10 years. What were the most important things you learned from your own teachers? What is the most important advice you would offer music students? To make the most of all opportunities. What was the best thing about your own course when you were a student? 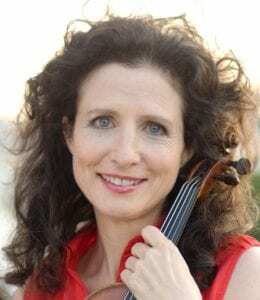 I particularly enjoyed studying for a Master’s degree in Performance and Literature at the Eastman School, New York, where there were choices beyond the 1/3 in violin performance. I was able to study courses in the history of American architecture, as well as music history, chamber music, and so on. What are your other major interests beyond music? What would you most recommend that music students do beyond practising their instrument/voice and rehearsing? Physical exercise, for instance, swimming, cycling, pilates, walking in the park, dancing (with earplugs! ), going to museums and art galleries and other cultural events. How has the music world changed your student days? Unfortunately music education is no longer free and available to all which is a great tragedy. However, technical standards have risen and there is greater internationalism. 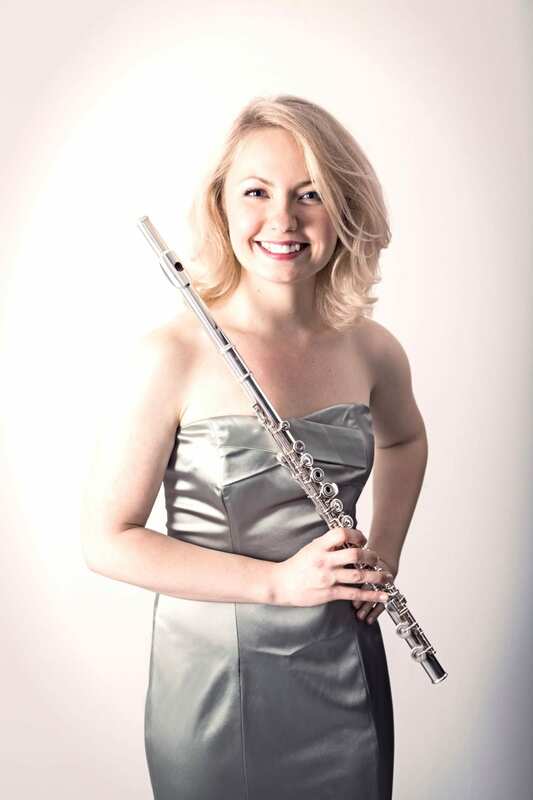 Madeleine introduces and performs excerpts from her album of chamber music by Grace Williams at 6pm on 1st March at City’s Performance Space, with a drinks reception afterwards. Reserve free tickets for the events here. This entry was posted in Uncategorized on February 25, 2019 by laudan. We start our series of interviews with some of our amazing visiting staff in the Music Department with flute teacher Alena Walentin. Alena, could you start by telling us something about your current performance projects? I recently recorded my debut solo album and also a second album with my wind quintet Atéa. Both albums will be released later this year which I’m very much looking forward to! I will also will be recording with my chamber duo partner harpist Anne Denholm for a planned release next year. As well as recording, I have some masterclasses and performances coming up in Denmark, the USA and in the UK, including with Ian Pace at City! Right now, I’m in the middle of a tour of Wales with Mid-Wales Opera as part of the Ensemble Cymru playing Puccini’s Tosca. So some really exciting and enjoyable projects. I feel that each conservatoire and university I teach at is unique and each offers a different but wonderful experience. When I was a student I had no idea that such an important part of my career would be teaching, but now I teach and give masterclasses in so many amazing places and I absolutely love it. I feel very humble and honoured to be teaching at City as well as at the Guildhall School of Music and Drama, Junior Royal Academy of Music and Royal Birmingham Conservatoire as well as giving masterclasses in different countries. I think sharing one’s knowledge is so important and it’s a very special, incredibly happy feeling when you hear your students progress and see that they enjoy playing the instrument! It would be very hard to identify one single thing – they all together form one thing! Everything from intonation, the technical side of playing the instrument, posture, breathing, rhythm, dynamics etc are all incredibly vital to being able to express the composer’s intentions to its fullest. But if I had to pick the very most important thing, it would be the feeling that I’ve had from when I first started to play the instrument: that music always should come first, technique second. Instrumentalists, of course, need a flawless technique to be able to be professional, but the musical part should always take first place. 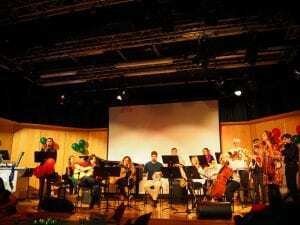 When an audience member comes to a concert, they might not know much about the instrument and how hard certain passages or aspects of the playing might be. However, they feel the music! And if one can make them cry, laugh, smile from real enjoyment or bring back to them sacred memories – that is what it’s all about and is the reason why we learn the instrument. And that is why I always aspire to be a musician, an artist and not an instrumentalist. And I wish to all the students out there to remember why they love music so much and why they want to play the instrument. Thank you very much for your time and good luck with your forthcoming tours! Alena and Ian Pace (piano) will present a lunchtime recital on Friday 15th March 2019 at 1:10pm. Click here for details and to reserve free tickets. The programme will include music by York Bowen, Vitalli and Rachmaninoff. This entry was posted in Uncategorized on February 15, 2019 by laudan. 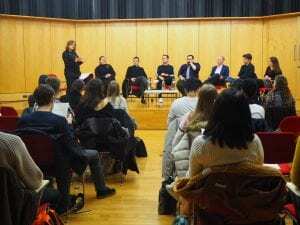 On Tuesday February 5th, the Music Department held its annual ‘Careers with a Music Degree’ evening, organised in conjunction with the City Careers Service. Panel members spoke about their particular areas of work, and offered valuable advice on the kinds of skills, qualifications and work experience needed in order to secure a placement or graduate position. They also offered useful tips on CV writing and interview skills. 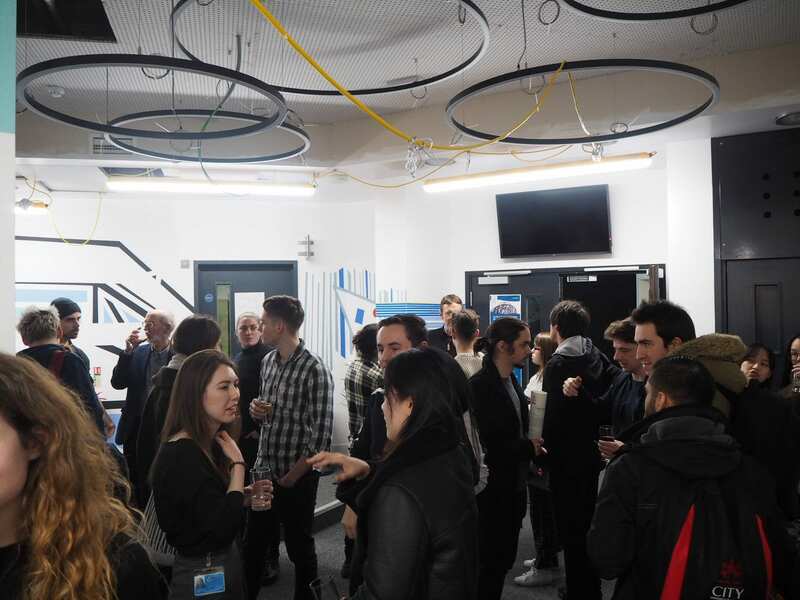 The evening was attended by about 40 BMus and BSc students, who were able to find out more about the breadth of professions open to music graduates. 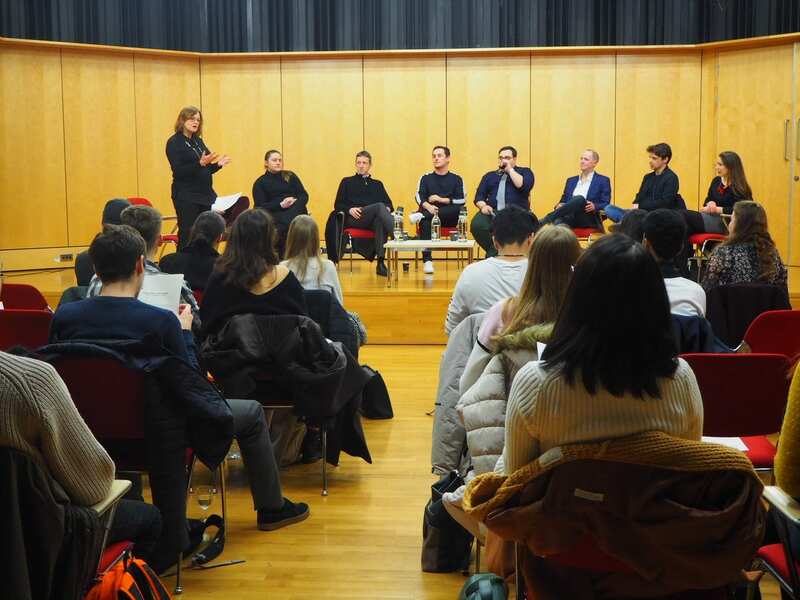 They also pointed to the kinds of transferrable skills that music students develop – including team-working, time-management, presentational skills and creative thinking – which are widely recognised and valued by employers. Students were encouraged to make full use of the City Careers Service, where they can access a range of support including mock interviews, CV writing and information on jobs, as well as opportunities to gain valuable experience through placements and volunteering. The main panel was followed by a networking session where students could talk informally with speakers. This entry was posted in Uncategorized on February 12, 2019 by laudan. 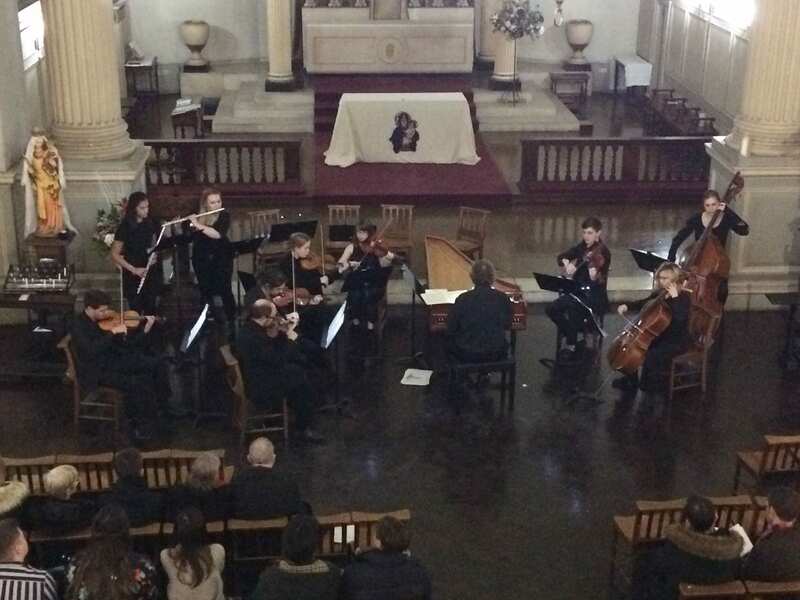 The first Music Department concert of the year took place on the evening of Friday 18th January, with the City Chamber Orchestra performing music by Bach, Handel and Mozart, conducted by our very own Tim Hooper. The concert was held in the beautiful church of St Clement’s, Finsbury, close to the university, and with a very appreciative audience. The programme started with J.S. Bach’s Orchestral Suite No. 2 in B minor, followed by a performance of the first movement of Mozart’s Clarinet Quintet in A Major, with second year BMus student Michael Cutajar playing solo clarinet. 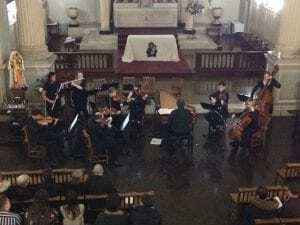 The final piece on the programme was Handel’s Concerto Grosso Op.6 No. 1 in G major. Many congratulations to all for a fabulous concert! This entry was posted in Uncategorized on February 1, 2019 by laudan. 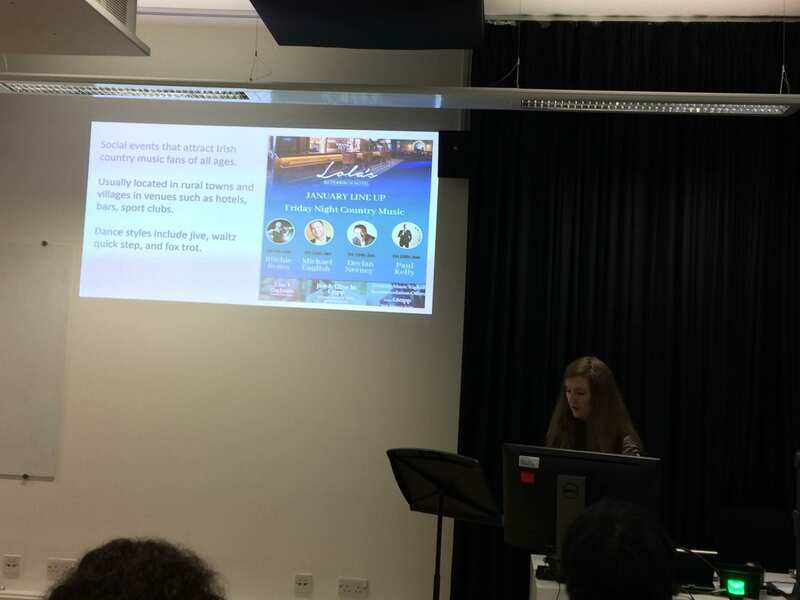 On 11th January 2019, Laudan Nooshin presented a Keynote paper at the Royal Musical Association/British Forum for Ethnomusicology Annual Music Research Students’ Conference, held this year at the University of Sheffield. Laudan’s keynote was entitled: ‘Space Invaders? Reflections on Diversity, Disciplinary Identities and a Music Studies for the 21st Century’ and discussed a number of issues around the need to foster a more inclusive and diverse Music Higher Education for the future. The keynote asked what the current state of Music HE reveals about the workings of power and privilege: what are the barriers to diversity, and how do such issues intersect with recent debates over ‘decolonising’ the academy? The second half of the keynote addressed similar questions, but in relation to disciplinary and sub-disciplinary identities. City was well represented at the conference, with presentations by current City PhD student Jonathan Higgins, who played some of his compositional work and presented a paper entitled ‘Faking the Past: The Noise of Obsolete Technologies in Contemporary Composition’; as well as by City alumni now pursuing doctoral studies elsewhere: Beanie Arkle (University of Surrey) talking about ‘Gustav Mahler and the Wagnerian Musical Turn: An Analytic Reading of the Role of the Turn’ and Hannah Gibson (Queen’s University, Belfast), whose paper was entitled ‘Dancing and Sociality in the Irish Country Music Scene’. It was so nice to see our former students doing so well in their postgraduate studies. 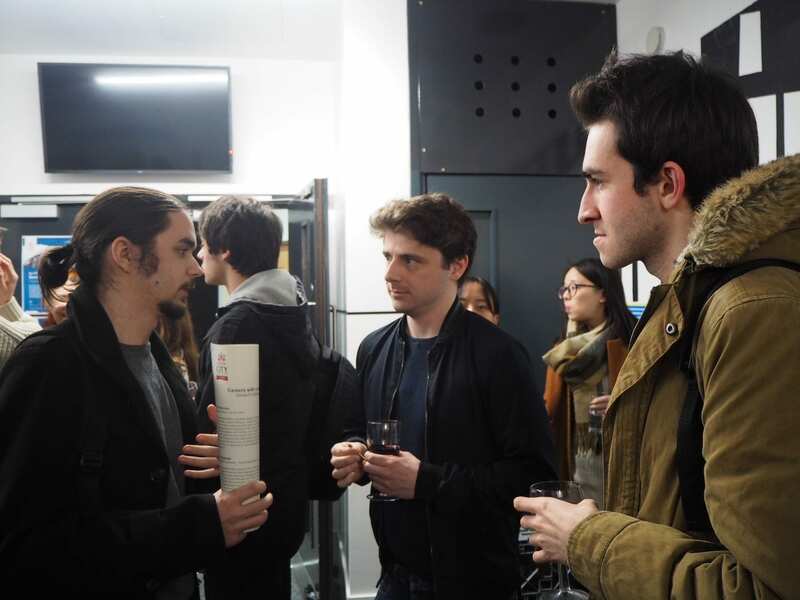 The RMA/BFE Research Students’ Conference brings together music research students from across a wide spectrum of areas, including musicology, ethnomusicology, composition, performance and other kinds of practice-research, music education, music psychology and more. Next year’s conference will be held at the Open University in Milton Keynes from 9th to 11th January 2020 and all our research students are strongly encouraged to attend. This entry was posted in Uncategorized on January 27, 2019 by laudan. 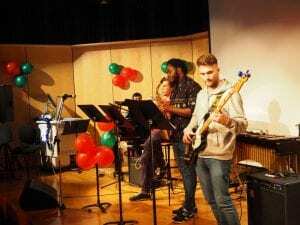 Music Department Christmas Cabaret 2018! On Friday 7th December, we ended the term with a big bang with the annual City Music Department Christmas Cabaret. The cabaret has been running since 2011 and is now an unmissable date in the department calendar. 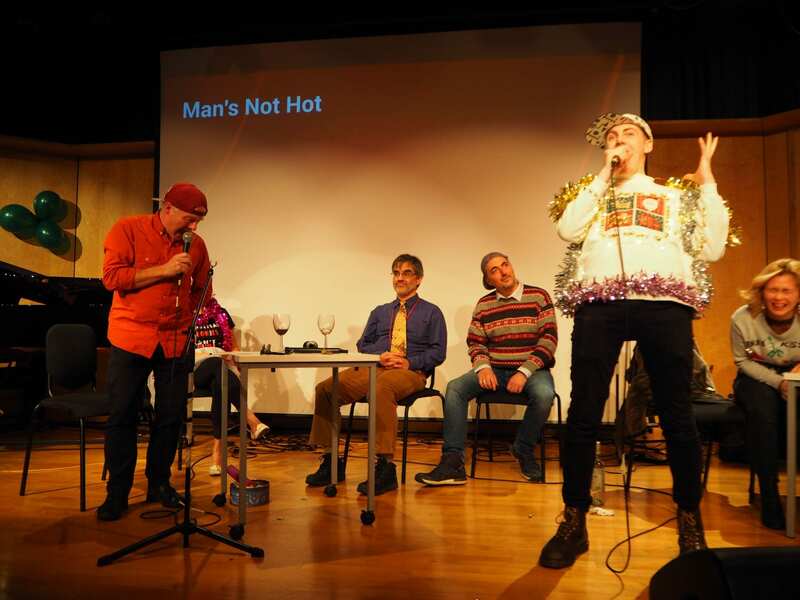 The afternoon began with a performance of seasonal pieces by the Balinese gamelan ensemble, followed by the (in)famous staff vs student quiz, which this year featured a revealing ‘Would I Lie to You?’ round and some impressive rapping by 3rd year student Will Brown and Professor Stephen Cottrell. Highlights of the afternoon included performances by the Balkan Ensemble and by members of Jazz-Improvisation Ensemble. 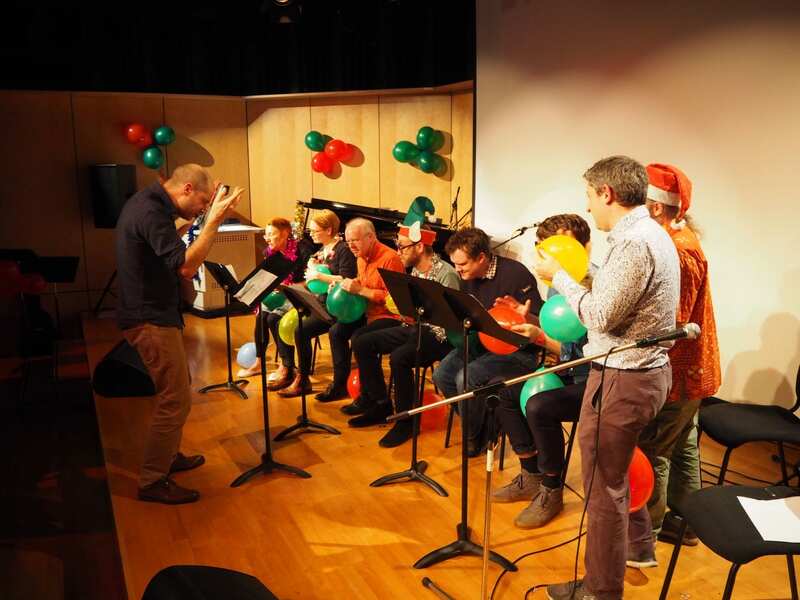 There was also a staff balloon ensemble (‘Hot Air’) performing David Bedford’s Balloon Music 1 (1973) and the staff also accompanied our very own City Music version of the 12 Days of Christmas. The afternoon rounded off with everyone dancing to the music of the Funk Band. The prize for most sparkly outfit was awarded to Will Brown and best Christmas jumper to Gabriel Makara. We also raised £85 for Mind, auctioning off two special edition Walls on Walls designer mugs. A big thank you to the organising committee – Helen Brand, Sam Jones, Mara Miron, Brandon Sands, Morten Vamplew and Hannah Wood – and also to Will Goring and Josh Mitchell for the sound and lighting, and to Claudia and Tullis for compering the afternoon. It was a great way to end the term. Happy Christmas everyone! This entry was posted in Current students on December 21, 2018 by laudan. 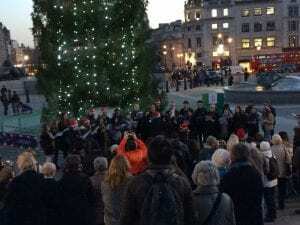 For their last performance of the year, singers from the Music Department and the university staff choir came together in the festive spirit of the season to sing traditional Carols beneath the famous Norwegian Christmas tree as part of the Greater London Authority’s Carol Singing Programme for Christmas. 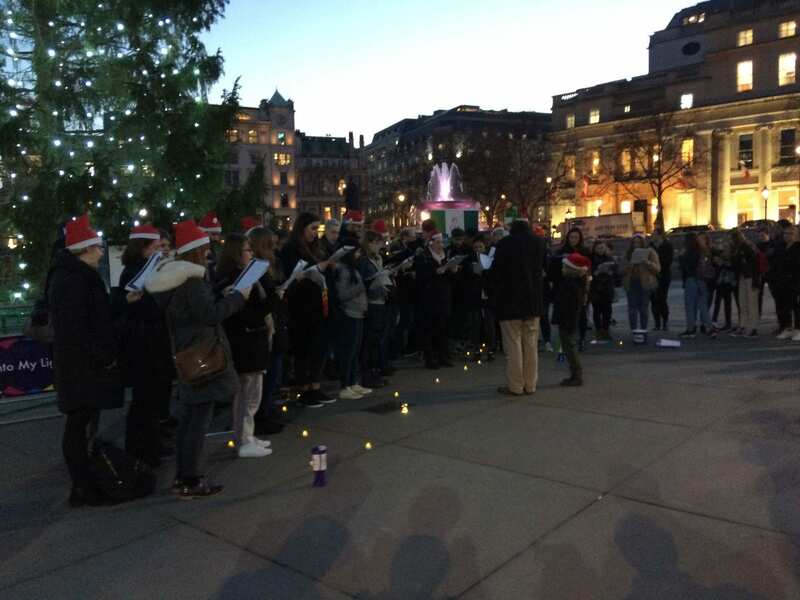 Densely wrapped to brave the cold, students and staff congregated in front of the mixed and enthusiastic audience, eagerly singing some of the most loved hymns and carols for an hour to raise funds on behalf of Mind and Islington Law Centre, their chosen charities. Favourites included Hark! The Herald Angels Sing; Ding, Dong! Merrily on High; In the Bleak Mid-winter; O Little Town of Bethlehem; We Wish you a Merry Christmas, Silent Night and O Come, All ye Faithful. In addition, the Staff Choir delighted the public with Carol of the Bells and the Chamber Choir added Sleep, my Jesu and Tomorrow Shall be My Dancing Day, for a memorable evening of Christmas cheer. Led by Tim Hooper and constituted by talented students from the Music and other departments, the City University Chamber Choir performs at the end of each academic term. This year, it sang Brahms’ Ein deutsches Requiem in St Giles’ Cripplegate church in London and also as part of the festival de Printemps de l’Université PSL (Paris Sciences & Lettres) in Paris during the spring 2018. 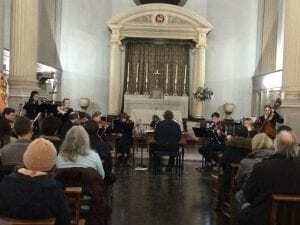 They recently performed their annual Christmas Carol Concert at St. Clement’s Church, in collaboration with Civitas, the university vocal ensemble devoted to the performance of early music and led by Dr Alexander Lingas. The City University Staff Choir is a community ensemble open to academic and professional service staff with no previous experience required, from across the university. The choir was set up 18 months ago by Louise Gordon, who also manages and conducts. 15 of its 25 members sang in Trafalgar Square and their beautiful voices brightly resonated together with singers from the Music Department, creating a light-hearted atmosphere for which the public showed appreciation. 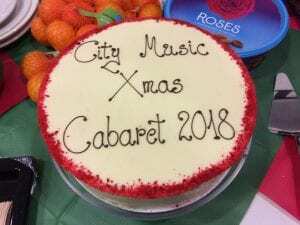 After the session, singers and staff were offered mulled wine and mince pies by the Music Department and had photographs taken by friends and the public. Many thanks to Tim Hooper for conducting the choirs, to Dr Alexander Lingas for joining the singers, to Dr Laudan Nooshin and Dr Ian Pace who diligently collected funds from the crowd and, of course, to all the singers who helped us raise more than £200 for charity! This entry was posted in Uncategorized on December 19, 2018 by laudan. Students taking the BSc in Music, Sound and Technology recently met at London’s Tate Modern gallery to experience Christain Marclay’s film The Clock. 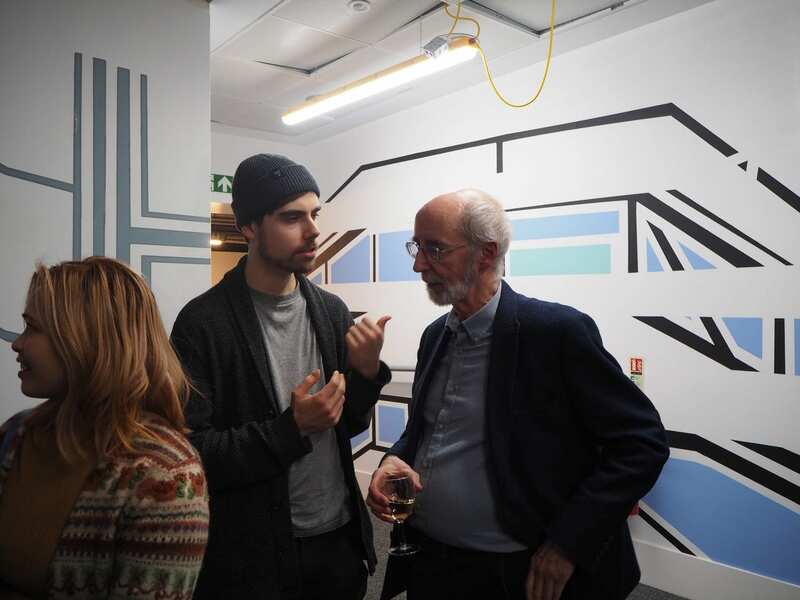 Marclay’s work connects with many topics that were discussed in the Music, Sound and Technology module throughout the term, including musical and audio-visual techniques of sampling, cut-up, splice and montage, as well as wider issues relating to authorship. and the use of environmental or found sound as compositional materials. Current student Fabian has written evocatively about his experience of the trip. We woke up that last Friday of our first term, excited and exhausted. It had been a long term of lectures, labs and assignments – but today was the day. We had only one more class, then the famous Christmas Cabaret – an all-department event filled with music, dancing, and a little too many bottles of wine. The morning was raining and cold yet none of that mattered because we were going to the Tate, one of the better modern art museums in London. Our lecturer, Tullis Rennie, brought the perfect storm. 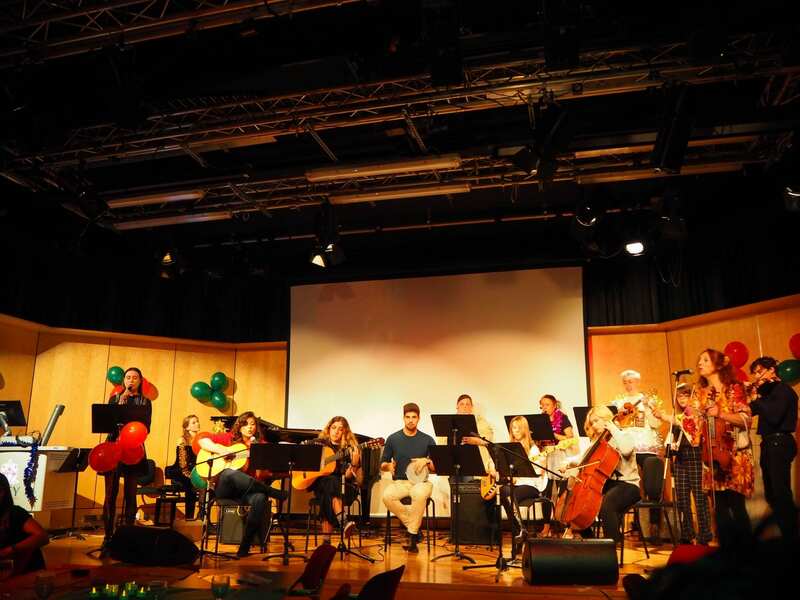 The last day of term, Christmas cabaret, and a field trip instead of class – it felt like being in primary again. 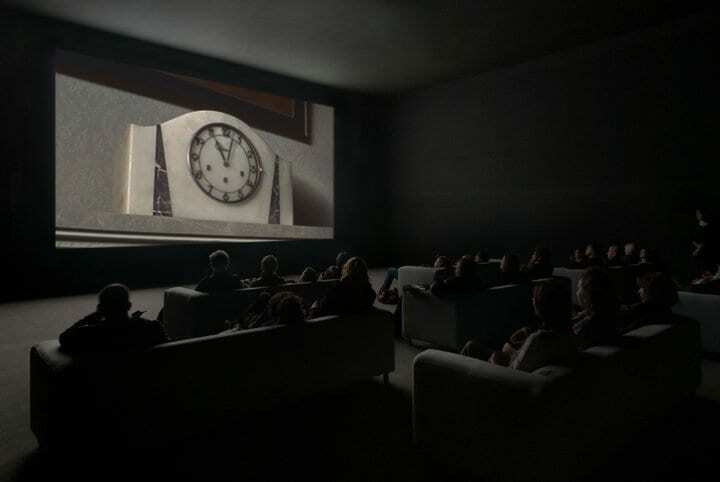 The reason we went to the Tate was due to their showing of The Clock, a 24-hour film by Christian Marclay. The film is a collection of shots of clocks arranged in real time, i.e. it is 10:24 in the morning so you see a clock in the film at 10:24. Thousands of shots from films arranged in perfect timing to the real world, so that every minute there’s at least one instant of the time. It could be a simple bedside clock, or someone can ask for the time and a character replies. You can see slices of popular films as well as random shots from films you would’ve never seen before. This collage is nothing short of a masterpiece, with the most impressive part being the cohesiveness of the shots in combination. Audio flows from one to the other, and the tracks make contextual sense – it’s not just random shots thrown around. It’s a precisely edited and arranged piece of art. We sat in the Tate theatre for around an hour in the morning, seeing the 10:15-11:15 am section of the film. I would recommend anyone that wants to see this piece to see it at any time they are able to. In the morning the film will be riddled with shots of people going to work, and at night with people stumbling home from a pub; yet every minute is an interesting peak into the way that civilization moves around in our 24 hour time frame. I only hope that we can have more field trips to further our outside experience into the arts. Go! Watch it – experience it. This entry was posted in Uncategorized on December 12, 2018 by Tullis Rennie.